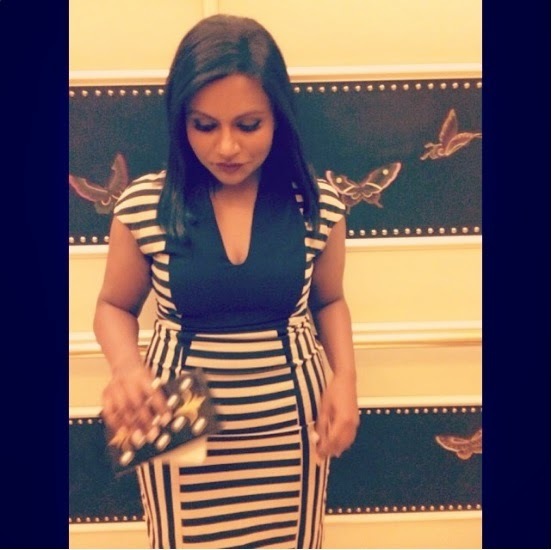 Mindy Kaling shared a photo carrying her favorite Thalé Blanc clutch on Instagram yesterday! The Mindy Project star showed off her Morning Dew Luxe Fleur De Lis clutch in Black Plexi with Ivory Pearls ($1,985) before a business meeting. This is the second time she was seen carrying this style from Thalé Blanc (www.thaleblanc.com). You can also see the super beautiful and trendy Mindy with this lovely clutch at the Made with Code Google event. You can see our post about Mindy Kaling at Made with Code that we posted this past Saturday. On that post we have included a more clear image of the clutch she is holding in the above photograph.